There are many series of kitchenware manufactured by Fagor. However the Splendid brand, as the name suggests is probably one of the series that stands out for its impressive design and performance. Many people who have used a Splendid have described it as it is – splendid. 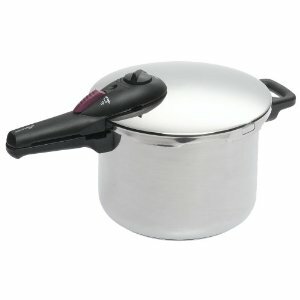 It is truly a great pressure cooker and if you are planning to buy one, you can look at this one. The Splendid is a very impressive series of pressure cookers from Fagor. It is made from high quality steel which keeps it durable and tough to handle the high pressures and still deliver top quality performance. The cooker has a single pressure setting at high or 15 psi. At this pressure the boiling point of water reaches nearly 1200C so the food gets good pretty quickly. The pressure cooking of food means that it does not need any oil and it retains most of the nutrients in the food. Thus you get wholesome nutritious and tasty food to eat. The base of the cooker is made up of three layers. It consists of an aluminum layer sandwiched between the high grade steel layers. This thick and flat base can cook efficiently and on any surface. You can use this cooker on gas, ceramic, induction or electric stoves and it will work equally well on all of them. The Splendid cookers are available in a wide selection of capacities like 4 qt, 6 qt and 10 qt. The 6 quart model is perfect for family use. It can hold enough food to cook a complete meal for 4-6 people. The 10 quart is larger and better suited for canning purposes. These cookers come with a visual pressure indicator to let you gauge the pressure within the cooker and operate it accordingly. It also has an automatic pressure release system. There is a selection option that lets the unit perform the pressure setting and pressure release functions. All these wonderful features have ensured that this cooker gets the nod from the Cooking Club of America. It is not just about the features. You also get a user manual which will make you comfortable with the operations of the cooker. Many times even the seasoned pressure cooker users have some trouble getting used to the new model the user manual can help tide this period of uncertainty. For the newbies, the user manual is the bible to follow. Another interesting complimentary value add is the pressure cooking recipe book. Most people do not know the true power of pressure cookers. They can do a lot more things than just cook grains. With a good guide, you can explore the exciting world of healthy and tasteful world of pressure cooking. This is where the recipe book comes in handy. Lastly, the unit comes with a 10 year warranty. This means that you can use it tension free for 10 years knowing that it is covered under the warranty. And of course, you will know take that long to realise that you have made a good investment. The pressure cooker is very easy to use - one pressure setting and no more removable thing on top that jiggles (which can easily be misplaced or lost). Clean-up was easy. Just wash out with warm water and mild detergent. The manual book isn't very clear on how to tell when the cooker is at full pressure.